Continuing our ‘interview with a travel blogger’ series, this week we have Gretta Schifano from the blog Mums Do Travel. I’m a journalist and I started my blog in 2012 as a way to share more about my travels than was possible in newspaper and magazine articles. Now the blog is my main focus, and I write about luxury, cultural and adventurous family travel with teenagers (my kids are now 15 and 20 years old) as well as trips when parents have the chance to travel without their children. Before I know it, I’ll probably be blogging about travel as an empty-nester! I love exploring new places, trying new things and finding out where the locals go. I also love discovering a different aspect to a place that I’ve been to before. Although family travel with teenage kids can be tricky, and requires compromise, I love it when we’re all together, away from the daily routine, and I treasure our family trips. It’s very difficult to choose a favourite place, but I do really love Italy. I studied Italian at University, worked in Piedmont teaching English for a year, and am married to a London-born Sicilian, so I’ve spent a lot of time in Italy over the years, and I always love going there. It’s such a diverse place geographically that it feels like a continent in one country, its culture and history are fascinating and the food is marvellous. Before you travel, research your destination and plan what you want to see and do there, to make the most of your trip. You can search for ideas online, buy a guidebook (Lonely Planet are my favourites), or borrow a guidebook (for free) from you local library. I research the destination beforehand, and then it depends who I’m travelling with. If I’m with my husband or with friends, we generally want to do the same kind of things, but if it’s a family trip then we need to discuss and agree our plan together, so that our itinerary has something for everyone. Once I arrive at a destination I look for local information to find out what else there is to see and do there. If it’s a family trip, we talk about it and decide together. Our family holidays have usually been to Italy, Spain, Portugal or France, but this year we went to Thailand, and had a brilliant time. I’m not sure where we’re going next, but we’re definitely due for an Italy trip, to catch up with friends and family. If I have the chance for a short trip away with my husband (i.e. if our 20 year-old agrees to be in charge of her brother), we like to go to somewhere new and explore it together. This year we had a weekend on the Algarve, and last year we went to Copenhagen for a couple of days. I take thousands of photos, so it’s hard to choose a favourite, but I love this one from our trip to Thailand. We were staying at a tented jungle camp in the rainforest, where they look after rescue elephants. We took part in an ethical elephant experience where we helped to wash and feed the elephants, and it was wonderful. 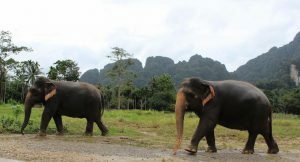 I’ve written about our trip in my post What’s it like to stay at Elephant Hills, Thailand? Hmmm, I have quite a few. How about this story, of when I was travelling with three friends in Greece as an impecunious student one Easter? It was our last night in Corfu before getting the ferry back to Italy, where we were studying. This was pre-euro days, we weren’t very organised, and we didn’t have much Greek money left. We were staying at a campsite, and we went to the nearby taverna, where we’d eaten the previous two evenings. We showed the owner our Greek money, and asked if it was enough to buy anything for dinner. He said yes, and showed us to a table. He then served the four of us a full meal, with drinks, which our few drachma definitely wouldn’t have been enough to pay for. When we tried to protest that it was too much to give us, and we couldn’t accept it, he insisted, gently. This was my first time in Greece, and I’ve never forgotten the kindness and hospitality that we were shown there. It’s very hard to choose just one, but I’m going to say Villa Alma in Puglia because, firstly, I’ve not been to Puglia yet and I really want to go there and, secondly, the villa looks amazing. It sleeps 10, so would be perfect for a trip with family and friends, AND it’s literally right next to the sea.